The views will be all yours from this comfortably furnished townhome overlooking the Graeagle Meadows golf course. 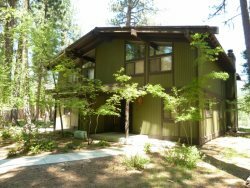 The open floor plan is enhanced by wood-beamed ceilings, original redwood, and a natural rock fireplace reflecting the mountain charm all around. The kitchen with an open pass-through to the bar and dining area allows for convenience as well as a place to sit and chat with the chef. Savor the gorgeous golf views and Penman Peak from your patio off the living area while enjoying your morning coffee or firing up the BBQ after golf. New living room furniture includes a large flat screen TV and fiber optics internet! We've know Dave for years, he always takes care of us. Great stay! Love #65. See you next year!